As Russia decides to back the Kyoto protocol, BBC News looks at the agreement which many say is the best hope for curbing the gas emissions thought partly responsible for the warming of the planet. The Kyoto Protocol is an international agreement setting targets for industrialised countries to cut their greenhouse gas emissions. These gases are considered at least partly responsible for global warming - the rise in global temperature which may have catastrophic consequences for life on Earth. The protocol was established in 1997, based on principles set out in a framework agreement signed in 1992. Industrialised countries have committed to cut their combined emissions to 5% below 1990 levels by 2008 - 2012. Each country that signed the protocol agreed to its own specific target. EU countries are expected to cut their present emissions by 8% and Japan by 5%. Some countries with low emissions were permitted to increase them. Russia initially wavered over signing the protocol, amid speculation that it was jockeying for more favourable terms. But the country's cabinet agreed to back Kyoto in September 2004. What does it mean when the Kyoto Protocol comes into force? It had been ratified by nations accounting for at least 55% of emissions from what the Treaty calls 'Annex 1' countries - i.e. those given specific targets for reducing emissions. These are the richer nations of the world, members of the OECD and the former Soviet Union. The first target was met in 2002. But following the decision of the United States and Australia not to ratify, Russia's position became crucial for the fulfilment of the second condition. It finally did ratify on November 18th 2004, and the Kyoto Protocol comes into force 90 days later - on February 16th 2005. Its targets for reducing emissions then become binding on all Annex 1 countries which have ratified - and 34 of the 38 have, the exceptions being Australia, Croatia, Monaco and the USA. Why did Russia decide to back the treaty? The deciding factor appears to be not the economic cost, but the political benefits for Russia. In particular, there has been talk of stronger European Union support for Russia's bid to join the World Trade Organization, when it ratifies the protocol. But fears still persist in Russia that Kyoto could badly affect the country's economic growth. Have the targets been achieved? Industrialised countries cut their overall emissions by about 3% from 1990 to 2000. But this was largely because a sharp decrease in emissions from the collapsing economies of former Soviet countries masked an 8% rise among rich countries. The UN says industrialised countries are now well off target for the end of the decade and predicts emissions 10% above 1990 levels by 2010. Only four EU countries are on track to meet their own targets. Is Kyoto in good health? Before Russia's backing, many feared Kyoto was on its last legs. But Moscow's decision has breathed new life into the protocol. The agreement stipulates that for it to become binding in international law, it must be ratified by the countries who together are responsible for at least 55% of 1990 global greenhouse gas emissions. The treaty suffered a massive blow in 2001 when the US, responsible for about quarter of the world's emissions, pulled out. The additional uncertainty over Russia's position was seen as another nail in the coffin, but observers are now hopeful the 55% threshold can be reached. Why did the US pull out? US President George W Bush pulled out of the Kyoto Protocol in 2001, saying implementing it would gravely damage the US economy. His administration dubbed the treaty "fatally flawed", partly because it does not require developing countries to commit to emissions reductions. Mr Bush says he backs emissions reductions through voluntary action and new energy technologies. How much difference will Kyoto make? Most climate scientists say that the targets set in the Kyoto Protocol are merely scratching the surface of the problem. The agreement aims to reduce emissions from industrialised nations only by around 5%, whereas the consensus among many climate scientists is that in order to avoid the worst consequences of global warming, emissions cuts in the order of 60% across the board are needed. This has led to criticisms that the agreement is toothless, as well as being virtually obsolete without US support. But others say its failure would be a disaster as, despite its flaws, it sets out a framework for future negotiations which could take another decade to rebuild. Kyoto commitments have been signed into law in some countries, US states and in the EU, and will stay in place regardless of the fate of the protocol itself. Without Kyoto, politicians and companies working towards climate-friendly economies would face a much rougher ride. The agreement acknowledges that developing countries contribute least to climate change but will quite likely suffer most from its effects. Many have signed it. They do not have to commit to specific targets, but have to report their emissions levels and develop national climate change mitigation programmes. 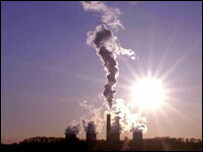 China and India, potential major polluters with huge populations and growing economies, have both ratified the protocol. Emissions trading works by allowing countries to buy and sell their agreed allowances of greenhouse gas emissions. Highly polluting countries can buy unused "credits" from those which are allowed to emit more than they actually do. After much difficult negotiation, countries are now also able to gain credits for activities which boost the environment's capacity to absorb carbon. These include tree planting and soil conservation, and can be carried out in the country itself, or by that country working in a developing country. One approach gaining increasing support is based on the principle that an equal quota of greenhouse gas emissions should be allocated for every person on the planet. The proposal, dubbed "contraction and convergence", states that rich countries should "contract" their emissions with the aim that global emissions "converge" at equal levels based on the amount of pollution scientists think the planet can take. Although many commentators say it is not realistic, its supporters include the United Nations Environment Programme and the European Parliament.